Song of a Greater Angle-wing (scroll down for explanation and additional recordings!). 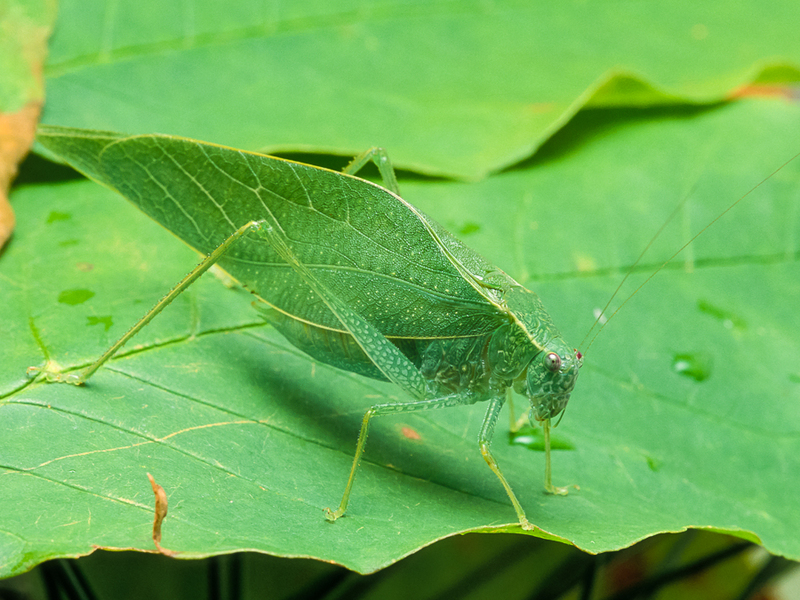 Astunning leaf mimic that has to be seen to be appreciated, the Greater Angle-wing can be identified by its green stridulatory field (the Lesser Angle-wing has a brown field). The intricate pattern of veins on the wings perfectly imitate the appearance of a leaf. This species is difficult to collect because it perches in the tops of trees and tall bushes. Sometimes, however, one can be found low enough to catch. May be very common in rural backyards, where its high-pitched ticks betray its presence. Song: The male has two types of songs. A staccato dzt! (pitched at around 9 kHz) may be given every few seconds. This song causes receptive females to approach the singing male. The second song type is a rapid series of high-pitched ticks, lasting several seconds. It is believed that this call is an aggressive signal to near-by males that they have strayed too close to another male and should move away. Sonogram of a Greater Angle-wing. © Wil Hershberger.